What products and services does Highland Memorial Park offer? Graves for both traditional burials and cremations. 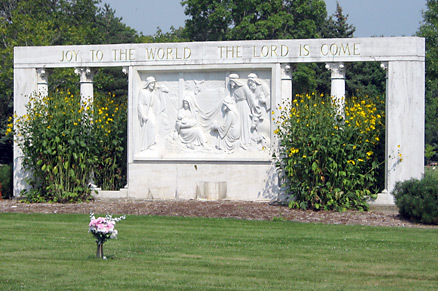 The Garden of the Apostles Columbarium for cremated remains. Bronze Grave Markers Concrete Burial Vaults Seasonal Grave Decorations. How many graves are still available? Highland Memorial Park still has over 10,000 graves for sale; in addition there are over 1000 Niches in the new Garden of the Apostles Columbarium. What Kind of Grave Decorations are available? We offer Silk Flowers for the Summer season and Balsam Wreaths and Crosses for the Winter Season. You may purchase these by mail, by telephone or soon through our online store. Why does Highland Memorial Park require Concrete Burial Vaults? Like most modern cemeteries, Highland Memorial Park requires a burial vault so that the grave does not “sink in” over time. Many vaults also have features that are designed to prevent moisture from entering the vault. What are the hours of Highland Memorial Park? Our grounds are open from Sunrise to Sunset everyday. Our office is open from 8:00 AM – 4:30 PM Monday through Friday. Also, from 8:00 AM – 12:00 NOON on Saturdays. Our offices is closed on Sundays and Holidays. What is a Memorial Park cemetery? Memorial Park cemeteries are specially designed to have the general appearance of a traditional park. We only use grave markers that are flat to the ground to achieve this goal. This allows the natural beauty of the gardens and trees to be the main focus of our landscape. Does Highland Memorial Park have rules about Grave Decorations? Yes, we have established rules to maximize the beauty of our landscaping while allowing families to honor the memory of their loved ones. Does Highland Memorial Park offer financing options? Yes, Highland Memorial Park offers no interest financing on Graves, Columbarium Niches and Bronze Grave Markers. In many cases we can offer payments for up to 36 months. Please contact our office for details.